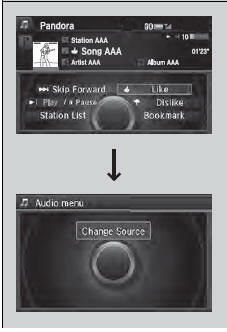 The menu items are shown in the lower half of the audio/information screen. Rotate to select an item and press . To select Change Source, press the MENU button, then press . To find out if your phone is compatible with this feature, visit www.acura.com/handsfreelink, or call 1-888-528-7876. You can control Pandora® using voice commands.